Ginataang Tanguige at Gulay is the fish version of Ginataang Hipon and Ginataang Alimasag, this today’s suggestion of a meatless Pinoy dish in observance of the coming Lenten Season or Holy Week. The vegetables used are basically the same but instead of prawns or crabs I used tanguige slices. Tuna or any similar fish may be used as an alternative choice. The combinations came out greater, just be careful with the fish slices, to avoid being crumbled just place the fish on top of the vegetables and carefully turning several time until perfectly cooked. Fish will not take a long time to cook. 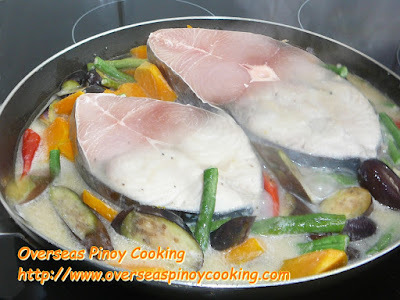 But if you are now looking for other ginataang recipe of seafood or fish for the Holy Week just click the links below. In a large frying pan sauté garlic, onion and ginger until fragrant. Add in half of the coconut cream and 1/2 to 2/3 cup of water, crushed peppercorns and fish sauce, bring it to a boil and let simmer for 2 to 3 minutes, constantly stirring to prevent from curdling. Add in the eggplant and string beans, continue to cook for 2 to 3 minutes. Then add in the pumpkin, chilies and the rest of the coconut cream, continue to cook for 3 to 5. Now add in the fish slices on top of the vegetables and continue to cook for 3 to 5 minutes turning the fish and vegetables several times. Correct saltiness if required. Serve hot with a lot of rice.